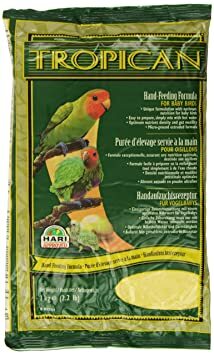 Vetafarm Hand Rearing Formula is recommended for all Parrots as a complete hand raising formula from 7-10 days old, to weaning and suitable for other bird species such as Passerines and Pigeons. Vetafarm Hand Rearing Formula should not be used with any other supplement. 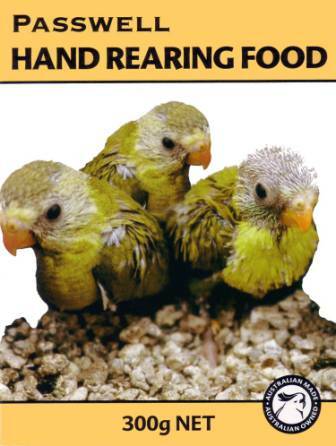 Hand Rearing Food is a veterinary balanced diet, mixing other foods or supplements will dilute the nutrition and unbalance a young bird’s diet. It is extrusion cooked for safety and increased digestibility, contains Probotic to promote healthy gut flora and is scientifically balanced to ensure precise nutrition in baby birds. 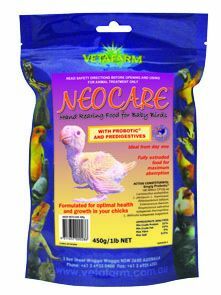 All necessary vitamins, mineral, calcium and amino acids are included for growing bones, organ function and strong feather development. Follow the below directions carefully if you are to have success with your hand reared babies. Food: For best results always start with a very runny mix. Add 2 small level scoops (scoop enclosed in packet) of formula to a jar or cup, then add one large scoop and one small scoop of boiling water. Mix thoroughly using a fork for 30 seconds or until an even consistency is achieved (like gritty milk). Check temperature and feed. The above mix then needs to be gradually thickened over a 48 hour period, at which point the below regular mixing directions are to be used until the bird is weaned. Mixing Regular Formula: Add one large level scoop of formula to a jar or cup, then add one large scoop of boiling water. Mix thoroughly using a fork for 30 seconds until a thick and consistent paste is formed. Add a further 3 small scoops of cool water and mix for a further 2 minutes or until an even consistency is achieved. Check temperature and feed. Food Temperature: The temperature of food fed to babies (irrespective of age) should be between 36-38ºC. Temps hotter than 43ºC will begin to burn the crop, lower than 34ºC will cause problems with digestion. It is important that you DO NOT use a microwave to heat the formula. Feeding Frequency and Amount: The age and species of birds being raised affects the amount and frequency of feeds. Be sure to research the requirements of your individual birds thoroughly before you begin. As a rule, the last feed of the day should be late at night around 10-11pm and the next feed early the following morning at approximately 5-6am. It is important to note that at the first feed of the day the crop should be completely empty. The crop should be allowed to empty completely once every 24hrs. Fresh Formula: Fresh batches of Neocare or Hand Rearing Food must be mixed each feed. DO NOT store or refrigerate any pre-mixed formula for later use. IMPORTANT – Hand Raising babies is a very complex task, particularly when dealing with Neonates or “day olds”. 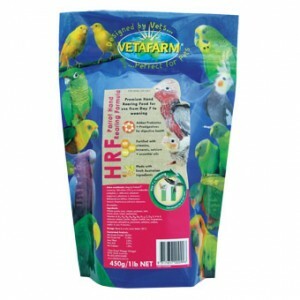 Vetafarm Hand Rearing Formula is a premium extruded hand rearing formula. ACTIVE CONSTITUENTS: 5mg/g Probotic® 180 Million CFU/g as Lactobacillus acidophilus; L. delbrueckii subspecies bulgaricus; L. plantarum; L. rhamnosus; Bifidobacterium bifidum; Enterococcus faecium; Streptococcus salivarius subspecies thermophilus. Minerals – calcium, copper, iron, magnesium, phosphorus, selenium, sodium, and zinc.